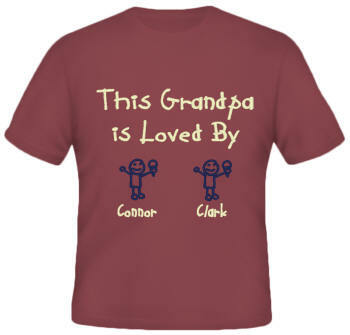 These adorable all embroidered Grandparent shirts for Grandpa and shirts for Dad are very unique shirts that Grandparents and parents will both love. Create any Grandparent shirt you'd like such as Nana Shirt, Grammy Shirt, or Memere shirt. These grandparent shirts can include up to 12 names of your children and grandchildren and are available in tees or sweatshirts in sizes up to 3xl. 9 oz. Sweatshirt : $25.00 / XXL and XXXL: $30.00. Personalization Price:Includes first 2 names, $3.00 each additional name. *IMPORTANT Each name MUST go on a separate line to avoid order delays.